You saw them over Christmas and now they are back, debuting on Blu-ray, DVD and digital download on March 27 and a chance to win your very own copy! How super exciting is that. You can never get tired of hearing ALVIIIIIIIN! Alvin, Simon and Theodore, with his female companions, the Chipettes, is big fun on a family vacation they will never forget in ALVIN AND THE CHIPMUNKS: CHIPWRECKED, debuting on Blu-ray, DVD and digital download on March 27th via Twentieth Century Fox Home Entertainment. The hilarious comedy with real actors will also be available in an exciting special edition, "Island Adventure" on Blu-ray and 2 DVD, loaded with fun for the whole family, which come just for Easter. The Chipmunks, The Chipettes and caregiver Dave Sevelle (Jason Lee, "My Name is Earl") embark on the journey of their lives in the Carnival Dream. Looking for fun and excitement, the Chipmunks transform this luxury cruise in their own playground. But the best vacation of all becomes a disaster when the Chipmunks, Dave, and the pelican mascot of the cruise – who is none other than the Chipmunks old manager Ian Hawke (David Cross, Megamind) - accidentally fall overboard and find themselves ‘chipwrecked’ on a remote island. In this uncharted territory, the six castaways are separated from Dave and must find a way to fend for themselves for the first time in their lives. 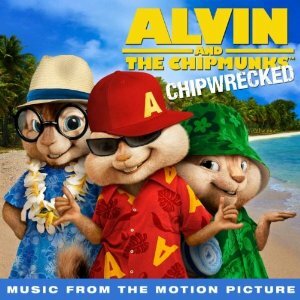 Written and produced by husband and wife Ross Bagdasarian Jr. and Janice Karman, ALVIN AND THE CHIPMUNKS: CHIPWRECKED voice has a cast of stars including Justin Long (Dodgeball) as Alvin, Matthew Gray Gubler ("Criminal Minds") as Simon, Jesse McCartney (Horton Hears a Who!) and Theodore, Christina Applegate ("Up All Night") as Brittany, Anna Faris (What's Your Number?) and Jeanette, and Amy Poehler ("Parks and Recreation") as Eleanor. Alvin and the Chipmunks started as an animation band in the United States in 1958, which was developed by Ross Bagdasarian, Sr. This created a unique trio of three animated chipmunks, Alvin, Simon and Theodore. Nearly six decades later, the franchise has an impressive collection of music albums, children's books, video games, television shows, television specials, animated movies and actors. 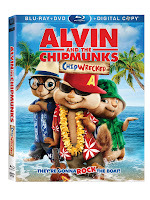 In addition, Alvin and the Chipmunks has received several award nominations, including fiveGrammys ®, two Kid Choice Awards ®, and an American Music Award ® among others, and continues to entertain families with lovable characters as shown in the new movie, ALVIN AND THE CHIPMUNKS: CHIPWRECKED. 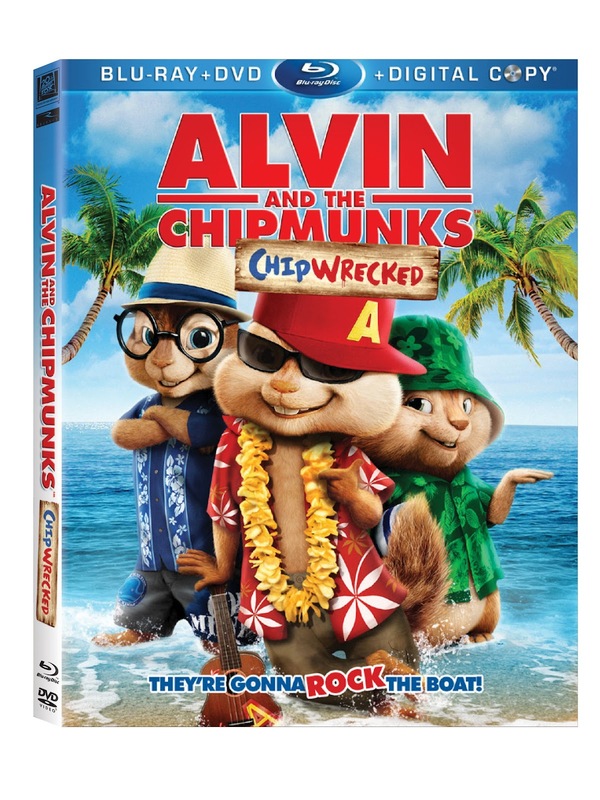 With a variety of popular songs ranging from "Bad Romance" by Lady Gaga to "Party Rock Anthem" by LMFAO, fans can dance to the special application Munk Music & Dance Machine in the Blu-ray and DVD ALVIN AND THE CHIPMUNKS:CHIPWRECKED. Additional features on the Blu-ray and DVD include music videos, behind the scenes, extended scenes and more. Fans can also enjoy an exciting Chipwrecked coloring application: Coloring with The Chipmunks, Blu-ray exclusive. The film will be available in Blu-ray and DVD at a suggested retail price of $39.99 and $29.98 respectively, and the Island Adventure edition two-disc will be available at a price of $ 34.98. Disclosure: This was not a paid post and no compensation was given. The giveaway product was supplied by the company/pr agency. I'd love to win this for my boys. We missed seeing it at the theater, and it looks really cute! We've enjoyed the other Chipmunks movies. My two year old is NUTS about the Chipmunks! He would loooooooooove it! My 2 sons are in love with the Chipmunks!!! They would go crazy for this!!!!!! We LOVE alvin!! Great giveaway!!! My grandsons love the Chipmunks! Thanks so much for the giveaway! My boys love the chipmunk movies! Thank you for the great giveaway! My boys are dying to see this movie!